‘To err is human, to blame ... even more so’ (unknown). It’s easy to feel powerless when you are hospitalized. Poorly designed hospital gowns which leave you half naked make it difficult for you to hold on to your dignity; and lying spread- eagled on the operation table can make even the strongest patient feel overwhelmed, scared and powerless. You are scared, and while the medical staff wants to help, they seem to be rushed and frazzled, and you are reluctant to intrude and upset their schedule. Doctors have their hands full with patients and anxious relatives pestering them with questions. Nurses are multi-tasking and making copious notes on each patient. Residents are doing multi-shifts and probably haven’t had a good night’s sleep in several days (or is it weeks?). Hospitals are unfamiliar terrain, and can be a lot like a minefield. Hospital hazards for patients are hidden, but if you don’t know where the mines are, how will you be able to avoid them? In a perfect world, these kinds of disastrous slip-ups would never occur. While hospitals have their own safety training campaigns to improve their processes and protocols to stamp out Never Events, the fact remains that humans are fallible and that mistakes do occur. What can you do to ensure that these Never Events never happen to you or your loved one in the hospital? Partnering with the healthcare team is the best way patients can get the best care! However , some patients find that talking to their doctor can be challenging. Their fear is that it might upset the doctor, and damage their relationship. However, such worries are unfounded. Good clinicians routinely invite questions and help patients make intelligent decisions, based on their personal preferences. If you have any concerns, please ask your doctor or nurse. You have a right to ask questions and get answers about your own health. There’s no need to be confrontational, but you do need to be assertive. Sometimes it feels like your doctor is too busy to talk to you, or maybe you’re embarrassed to ask some questions. If you are scared, you can ask the junior doctor or the nurse your queries, but you need to remember that messages can get garbled during transmission. Remember that your nurses and doctors all want the same thing: for you to get better quickly. As the patient, you too are part of the health care team. It’s important that you prepare, listen carefully, and speak up when you need to. Because the time your doctor can spend with you is limited, you will feel less rushed if you prepare your questions in advance. Remember that Questions are the Answers, and the quality of the doctor’s answers will depend upon the quality of your questions! You can learn how to ask good questions at http://www.ahrq.gov/patients-consumers/patient-involvement/ask-your-doctor/index.html. Here are some useful suggestions. * Ask health care workers to introduce themselves when they enter your room and look for their identification badges. If you are unsure about their identity or occupation, ask! ** Make sure your nurse or doctor confirms your identity from your wristband or asks your name, before he or she administers any medication or treatment. Don’t hesitate to tell the health care professional if you think he or she has confused you with another patient * Verify that blood and other specimens taken from your body are labeled in front of you. * Know your doctor and his team. Make friends with your nurses and the technicians – make sure they address you by name at least once every shift. * While hospital management discourages tipping, a lot of family members find that giving gifts to the hospital staff helps to ensure that their patient gets VIP treatment. This isn’t something you should be doing as it encourages the hospital staff to discriminate between patients. * Know whom to call for help in case of a medical emergency (how to activate a CODE Blue). Your medical records summarize your treatment course during your hospital stay, and are very valuable documents. While many hospitals treat these as their property, they are your records, and it’s a good idea to review them on a regular basis, to ensure that there are no errors in them. Some hospitals are reluctant to share the records with the patient, but this is an archaic attitude, and needs to be changed. You need to make sure that the notes are legible; complete and updated . All the lab results and scan reports should be filed in a timely fashion. 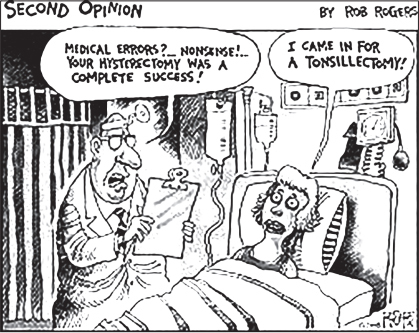 If something is not clear or is missing , ask the nursing staff or the doctor. You need to remember that as a patient, you are not just a passive recipient of medical care, but you can actively help to promote safety and reduce risk. One way is to complain if you have a bad experience, because these could be a result of unsafe systems and careless doctors. All of us have been in hospitals, either as patients or as visitors, and we know from personal experience that many hospital processes are broken. Since patients are at the receiving end of many near misses, patient feedback can help hospitals to promote positive changes. Patient complaints are also useful markers of dysfunctional doctors, and the systematic analysis of patient complaints can help the hospital management to identify high risk physicians. Typically, 80% of the complaints will involve 20% of physicians, and these are the ones who jeopardize patient safety, by being rude or cutting corners. The majority of these physicians are often not aware of their risky or unsafe technical and interpersonal behaviors. Patient complaints offer a powerful tool for identifying these error- prone, high-risk physicians and most physicians respond positively to feedback, because they know that this can help them to improve. Many will agree with the issues identified and will ask for help, while others may need to be fired, to stop them from harming other patients.